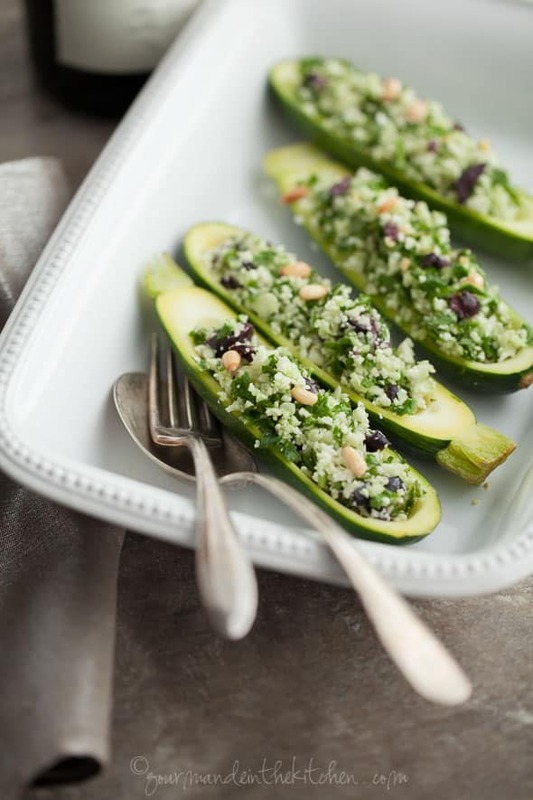 Zucchini boats are filled with a crunchy mixture of cauliflower “couscous” flavored with baby spinach and fresh herbs then topped with pine nuts. Zucchini has become somewhat of a staple at mealtime here, which always seems to be the case around this time of year when they’re at their most plentiful. And when they’re as fresh and tender as they have been, there’s no reason to even cook them. The slender ones have an especially creamy interior that make them the perfect candidates for being eaten raw. These particular stuffed zucchini boats are filled with a crunchy mixture of raw spinach and cauliflower “couscous” dressed with lemon juice and olive oil. 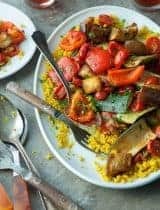 I throw in a good quantity of fresh mint, oregano, garlic and olives for a multitude of tastes and textures inspired by the Mediterranean along with some lemon zest for extra brightness and good measure. It’s a simple dish with big flavors that comes together quickly, which is always welcome come dinnertime when you’re short on time. (The lengthiest part of the whole thing is the salting which helps to soften and tenderize the zucchini even further before stuffing so don’t skip it!) The filling can even be made ahead of time and the zucchini stuffed right before serving. 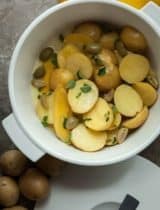 You can treat this as a side dish, a light lunch or cut them into bite-sized pieces for a party or picnic platter. What’s your favorite way to eat zucchini this time of year? These stuffed zucchini boats are filled with a crunchy mixture of raw spinach and cauliflower “couscous” dressed with lemon juice and olive oil and topped with pine nuts. 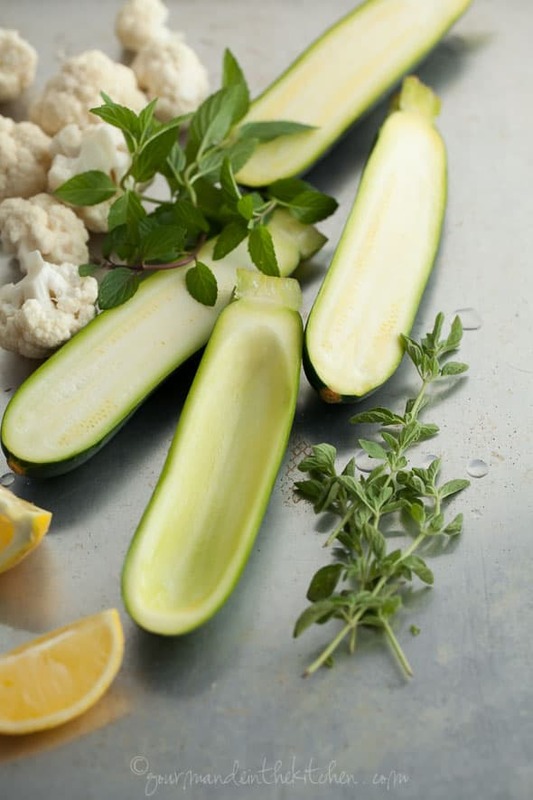 Cut each zucchini in half lengthwise; scoop out the seeds and pulp from the center. Sprinkle a generous amount of salt evenly over the zucchini. 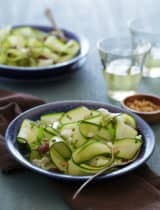 Place the salted zucchini face down on a shallow dish and set aside for at least 15-20 minutes to drain. In the meantime make the filling. Whisk together the lemon zest, lemon juice, minced garlic, olive oil, and a pinch of salt and pepper in a medium sized bowl and set aside. Add the chopped cauliflower, to the dressing and toss to combine. Add in the chopped spinach, finely chopped herbs and chopped black olives and toss again. Flip salted zucchini halves over and wipe dry with a clean cloth. Spoon cauliflower stuffing into each zucchini half, top with pine nuts and serve immediately. I love this! great idea Sylvie! What a great idea to add the cauliflower couscous to the zucchini! Such great flavors, colors and textures! I love the flavors you have going here, and they're so pretty! These look so good I think we might have to change dinner plans and have these instead! So, pretty, healthful and mouthwatering! I love all those gorgeous flavors.. 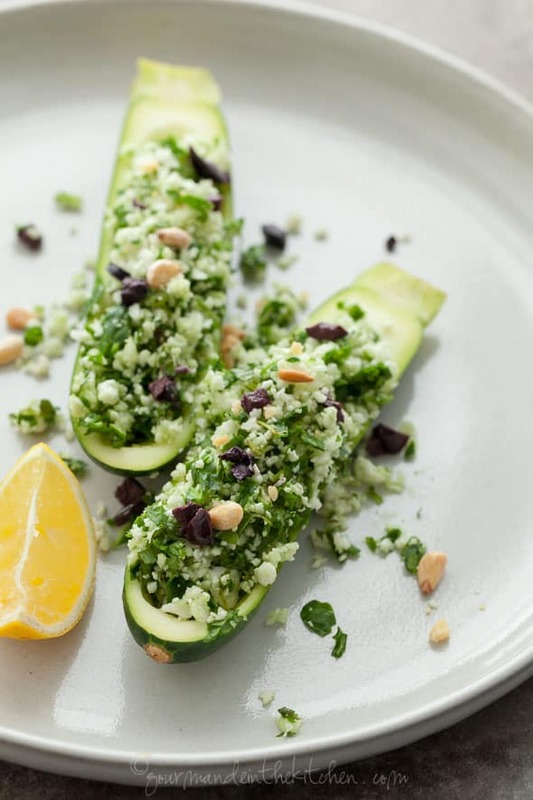 I often stuffed zucchini with couscous and grill it on cedar planks so I'm loving your raw version with the fresh herbs and pine nuts! You're correct when you say that this is the time of they year zuchhini is abundant. Here in Buffalo, NY we have about six pinky sized one's in the garden with tons of flowers that will be producing soon. It take a little longer here. After a few weeks I need a new zucchini rendition. Here it is. It's different from the norm and looks really good. Printing recipe and making latter. 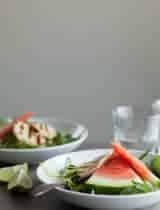 Filing this away under "awesome summer lunch ideas"--looks fantastic. These are a beautiful way to make your summer dinner just perfect! I love them! I found you from facebook! Glad to connect I host a weekly GF recipe link up that goes live Thursday nights at 7 pm eastern. Bloggers come and link up their fav GF recipes, I've love to have you stop by! Fabulous. 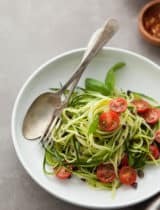 I must try these soon and will since I am about to have more zucchini than I know what to do with. The filling sounds amazing!! 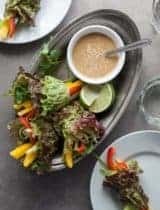 If all raw food was this good, I'd eat it all the time! Love all of the flavors in this! Pine nuts, olives, and mint - yes please! This looks super delicious and healthy! I love it!